Around 1997, when my wife and I first came to Crestone, Colorado, there was a buzz going around town about an amazing new building material that its inventor, Mike McCain, called “fibrous cement,” but that has become more widely known as “papercrete.” Mike, with his tremendous enthusiasm, was generating interest in the wonders of his new discovery: that if you mix a bit of Portland cement with re-pulped paper you end up with a malleable building material that can be used for almost any building project. It was described as cheap, easy to make, environmentally sound, insulating, insect and fire resistant, holds nails and screws without cracking, can be cut with ordinary saws, is lightweight… in other words a dream material for building! Mike shared his enthusiasm through conducting workshops on how to make this stuff and demonstrating its merits at the Crestone Energy Fair. Like many locals, I became intrigued with the potential of papercrete. At the time I was collecting footage for a video program I was working on called “A Sampler of Alternative Homes: Approaching Sustainable Architecture,” and I decided to include papercrete in this. While videotaping other segments for this program in New Mexico , I discovered that Mike was not the first to have discovered papercrete! Eric Patterson of Silver City, New Mexico , had actually patented the process of making the exact same material, which he called “padobe,” (as in “paper adobe.”) Eric is a printer by trade, and was looking for ways to utilize all the waste scraps of paper that accumulated at his print shop, when he and his daughter used a kitchen blender to make the first batch of paper and cement slurry. When this paste was set out to dry, it eventually cured into a very solid block, and the bells started going off in Eric’s head. He made a bigger blender and started making adobe block sized padobes. When he had enough of these made, he first built a wall, and then an addition to his house, as well as a domed studio using nothing but the blocks joined with a mortar of the same material. Eric tried to commercialize on his invention for awhile, but eventually realized that it was best left in the hands of individual entrepreneurs to do with as they pleased, and he no longer tries to enforce his patent. At least two other “inventors” of papercrete predate both Mike and Eric; one of them made a small papercrete shed in 1991 in Texas that he claims is still as good as new. It seems that the idea of mixing cement and paper pulp is a perennial event. Back in the early days of papercrete euphoria, experimentation was burgeoning. We decided to play with the material to plaster our earthbag house. Several houses were begun, with assistance from Mike McCain, including some rather freeform structures that were started with no other foundation than the papercrete being laid right on the ground. It all seemed fair game at the time, limited only by one’s imagination. 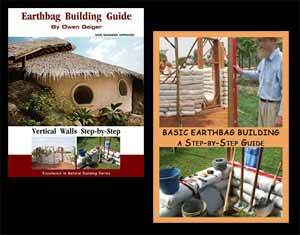 Other, more conventional buildings were also being made; one of these appeared in an article in Mother Earth News about paper buildings. I recently visited Abi David, who with the help of many other people, has built a charming papercrete house. Abi was initially planning to make a straw bale house, and then someone offered to provide large bales of paper to build with. When this concept fizzled, she turned to papercrete blocks as an alternative, and has been quite pleased with the results. The house is very well insulated and quite sturdy. She has been experimenting with a variety of ways to plaster the walls, both inside and out. Builders have tried lots of approaches to using the stuff: little blocks, big blocks, panels, slurry pumped into slip forms, rigs to spray it on mesh, applied by hand as a plaster. All of these methods have worked, with varying degrees of success. Lots of different mixes have been tried, with different ratios of cement to paper or adding clay or sand to the mix. Machines to make the stuff have taken many forms, from simple little barrel mixers to more sophisticated tow mixers made from car rear ends, stock tanks and lawnmower blades to large industrial stationary mixers. Mike was even making slurry with a garbage disposal. Since the early days of experimentation, much has been learned about papercrete and its properties. As with all building materials, papercrete requires careful use in appropriate ways, or the builder could be courting disaster. Of these three problems, mold is probably the most serious, and the most difficult to avoid. This is because papercrete acts like a sponge, absorbing water and wicking it well beyond the point of entry. Once the papercrete is moist, and if it remains so and is warm enough, it becomes a perfect medium to harbor mold, and some molds can create an unhealthy living environment. At least two of the earliest papercrete buildings have become uninhabitable because mold has taken over parts of the structure. This can happen where the papercrete is in direct contact with the earth and cannot dry out, or when a moisture barrier is applied to it and this coating is breached somehow so that water can find a way in, but cannot easily evaporate. My suggestion for would-be papercrete builders is to not make a roof out of it and keep it out of the ground. 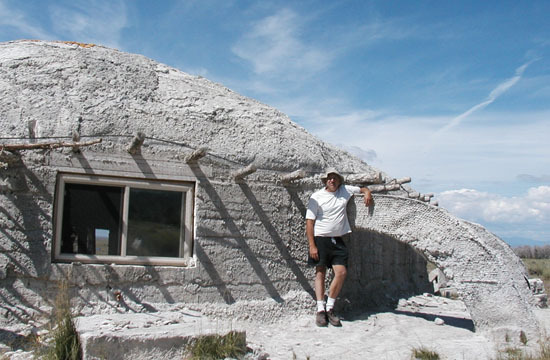 My earthbag domes are completely plastered with papercrete, but this is a very different situation, because the scoria-filled earthbags isolate the moisture laden papercrete to the outside, where it can readily evaporate. As for the other problems that Harun mentioned (shrinkage and slow drying time), there are ways to deal with these. Shrinkage can be minimized by the addition of quite a bit of sand to the mix. This also tends to make the product much more fire resistant, since the straight papercrete can smolder if it gets hot enough. The addition of sand makes the papercrete more abrasion resistant, although it also makes it less insulating. As for the slow drying property, the best strategy is to work during the long warm days of summer, keep the occasional rains off from it, and allow it to air dry on all sides. The truth is that papercrete has proven to be a very useful building material that is relatively inexpensive to make, malleable in its form, and fairly environmentally benign. There is great satisfaction in putting to use the heaps of junk mail, newspapers, magazines, and catalogs that tend to accumulate. 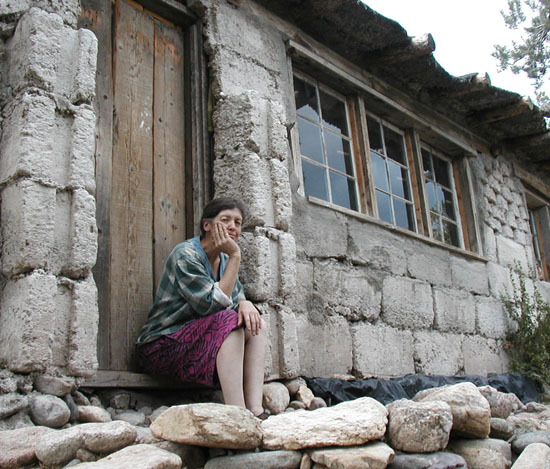 When care is taken to keep solid papercrete walls from absorbing moisture, just like with straw bales, they can provide safe, durable, well-insulated protection from the weather. Only time will tell how durable this stuff is, but the signs are promising. The papercrete plaster that I applied to the outside of my first experimental dome was eventually replastered with stucco to protect it from eroding. But as long as the walls are protected from too much exposure to the elements they should hold up well. At 3 Moons project we have been adding paperinsularion 1 bucket x 2 dirt whatever. First few rather thin coats final mix with sand, lime , will tell you know how many years will hold up ! Thanks for sharing on history and use. Great article. On additional issue that tends to be ignored is strength. So many projects are begun without making any engineering calculations. So many materials are mixed and used without any testing to determine the materials load bearing abilities. Unfortunately, many of these builder’s projects, which start with great enthusiasm and dreams of the perfect, wonderful building either become a maintenance nightmare or uninhabitable. Climate and usage dictates an appropriate approach and mix. Papercrete comes in as many forms as it does mixes. Especially with a risky wonderful material such as papercrete, consider how all the parts of a house interact wrt water management, vapor drive, molecular compatibility, insulation, etc. I like the name padobe, because if it is in thick block form and not of a rich mix, it should be treated and protected like an adobe wall block, preferably under a quality roof overhang, sitting on a stem wall, in a dry dessert. And plastered appropriately for the climate and site conditions. Fiberous cement, sounds reminiscent of the bombproof “fiber cement” siding, such as hardi siding. And with a sand and cement rich mix, a harder, long wearing exterior render mix can be created. I like to use these two terms to describe these two different forms of papercrete. Shrinkage–add quality sand, and more binder. Slow drying–use in dry climates and thinner applications. At least let it breathe to one side once completed. There is a commercial production company out of, I believe, Mason TX. They make a great papercrete brick. Not too cement rich, but you wouldn’t know examining it. I believe they add a respectable amount of waterglass to the mix and then hydraulically compress the bricks. They had great engineered PSI specs in their literature last I read it. Great article, Kelly! Every new building method claims to be the “latest and greatest” but the truth is every one has pros and cons and the most important thing is to use materials appropriate to your climate. I’ve used papercrete on top of a roof for insulation and that was a huge mistake in Georgia! But used where appropriate, it can be great to work with. Thanks for such an informative, well-balanced article!